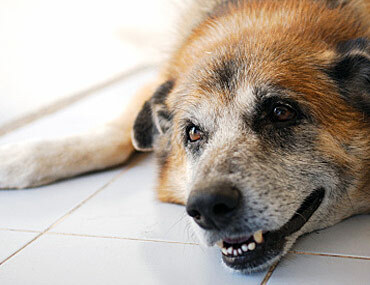 Myasthenia gravis is a disorder affecting our canine friends. It is caused by a breakdown of the transmission of impulses from the nerves to the muscles. This keeps the muscles from contracting, causing affected dogs to become weak—the number one symptom of this neuromuscular disease. Though rare, myasthenia gravis can be an inherited congenital defect that pups are born with. Some breeds at risk for the congenital form are Jack Russell terriers, springer spaniels, and smooth fox terriers. More commonly, myasthenia gravis is an acquired problem in adult dogs that is thought to be the result of a defect in a dog’s immune system caused by antibodies that mistake the dog’s muscle receptors as “bad guys,” attacking them and preventing them from working properly. Both female and male dogs are equally at risk, and all breeds are susceptible to this disease. Dogs that acquire mild forms of this disease later in life have a fairly good prognosis, so long as they receive proper, timely treatment. Symptoms of myasthenia gravis can vary greatly from dog to dog. The most common symptom is muscle weakness that worsens with exercise but improves with rest. Often the esophagus is affected, and dogs have trouble swallowing and drinking. They may also regurgitate food. In some situations, affected dogs aspirate food and water, which can result in pneumonia. If your pet suffers from muscle weakness, your veterinarian will take a thorough history and perform a complete physical exam on him. If your four-legged friend is diagnosed with myasthenia gravis, your veterinarian will tailor your dog’s treatment specifically to his needs. Treatment may include the use of anticholinesterase drugs. These help to improve muscle strength by reducing the antibodies’ attack on muscle receptors, allowing the muscles to work better. Because dogs with myasthenia gravis have a poorly functioning esophagus, they need to eat or be fed carefully. Make sure that your dog’s head is elevated during feeding and for 10–15 minutes afterward. Pneumonia can be a very serious side effect of any disorder that impacts a dog’s ability to swallow correctly. Your veterinarian will work with you to identify the best way to make sure your dog can eat and drink without the risk of regurgitation or aspirating food/water. Unfortunately, there is no prevention or cure for this disease. Treatment and vigilant at-home care can help dogs with this disease maintain a quality life for a long time. The more attention paid to the prevention of aspiration pneumonia, the better the prognosis.